Oil on canvas view of the Moore Shipyards painted by William A. Coulter in 1919. Moore Shipyards was the largest of the shipyards on the Oakland Estuary. The company first moved to the foot of Adeline St. as Moore and Scott in 1909. Work included building and repairing ships such as tankers, ferryboats and dredges. Business was good, but it was the need for ships in World War I that swelled the workforce to 12,000 men. In one day in 1919, three tankers and three freighters were launched in one tide, setting a world record.After the war, demand for new ships declined, and work shifted to the repair of ships in dry dock as well as production of structural steel for buildings and bridges. Projects included building both the Park St. and High St. bridges as well as structural elements for the Paramount Theater and the cyclotron at UC Berkeley. The workforce between the world wars averaged around 2,000.World War II caused the next boom in shipbuilding. Moore Dry Dock expanded dramatically leasing additional land and building ships, steel fabricating and machines shops, and worker housing. The workforce reached a peak of 37,000 workers employed around the clock in 1943. Workers welded literally miles of metal seams in the construction of 112 ships between 1938 and the launch of the last sea-going vessel from Moore Dry Dock in 1945. Moore Dry Dock closed in 1961. The site is now (2002) occupied by Schnitzer Steel which recycles metal.Exhibition Label: "Scene in Oakland", Oakland Museum of CaliforniaMarch 9 - August 25, 20023. William A. Coulter (1849-1936)War Time, 1919Oil on canvasGift of Moore Drydock CompanyThe Moore Dry Dock was the largest of the shipyards on the estuary. The company moved to the foot of Adeline Street in Oakland in 1909 where it remained active until 1961. Building and repairing ships of all types, it was the need for warships upon America's entrance into World War I, that increased the workforce to 12,000 men. 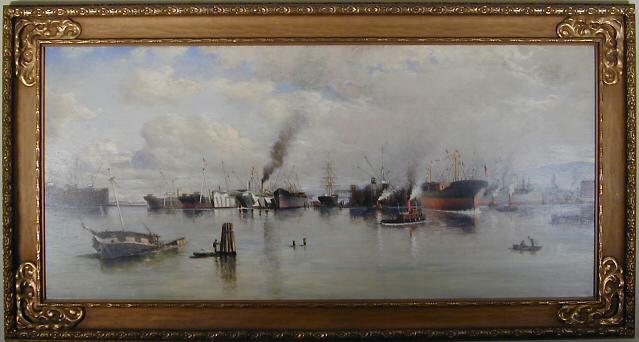 William A. Coulter painted this shipyard panorama in 1919, as viewed from the estuary, with Oakland City Hall in the far right background. Coulter was the Bay Area's most prominent painter of marine subjects during the late nineteenth and early twentieth centuries.